Excuse the temporary non-tech focus of this post - but yesterday marked the third birthday for Matthew and Sarah, Silicon Valley's favorite set of twins, who were pre-announced on this blog, arrived on June 20th, 2008, wore their unfair share of tech onesies from companies that have succeeded and failed, and celebrated two other birthdays in the interim. Last year, they even welcomed baby number three to the midst and have continued with their mostly upbeat spirits, inviting Braden as part of the family. 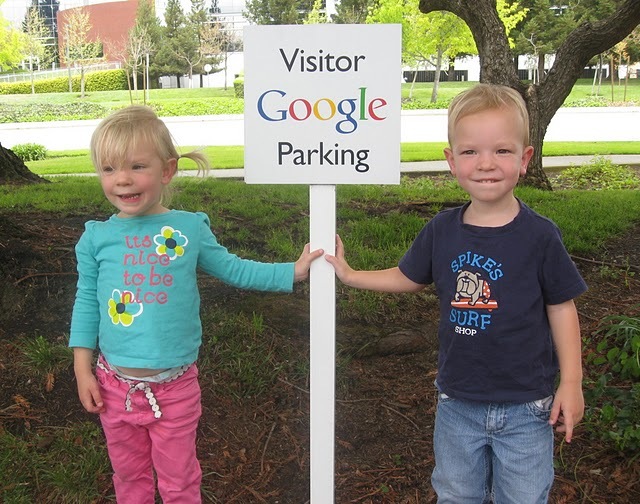 Living where we do, in Sunnyvale, just by 85 and 280, the twins live right between the headquarters of two of the world's most successful companies, Apple and Google. Some nights, we drive by Cupertino headquarters and point out all the Apple signs in their various colors... "Look daddy! Pink apple!" or we'll head the other way and have the kids play among the Android robots by Building 44 on the Google campus. The twins have mastered Netflix and YouTube on the iPad, and live in a world when they expect any show they want to be on demand immediately to any device. They refer to my 7-inch Samsung Galaxy Tab as "baby iPad", and the 10 inch Galaxy Tab as "robot iPad". How deep is their tech immersion? I swear to you the only word Sarah can read is "Google", regardless of colors or font. She can read Google on a page, on a shirt, on a sign and on the Web. "Daddy! Google!" So yes, two geeks destined for a life of electronics and gadgetry. Could be much worse. As for us, despite the occasional challenges presented by a houseful of little ones, I don't have (m)any complaints. They're delightful and funny, helpful and curious. At times, it seems we've had them in our lives forever, and other times, it seems there's no way they're already three. But they are. Next thing I know, they'll be in kindergarten, and we'll be on our way. Happy Birthday (+1) to Matthew and Sarah.